Have you ever dreamed of travelling back in time to a more serene and peaceful period when nature is still thriving. And people spend their days chatting with families and friends outside their homes, catching fish, or planting crops in their fields? Then, the quiet and idyllic farm town of Pagudpud, Philippines should definitely be on top of your travel bucket list. With a fair few things to do in Pagudpud Philippines. 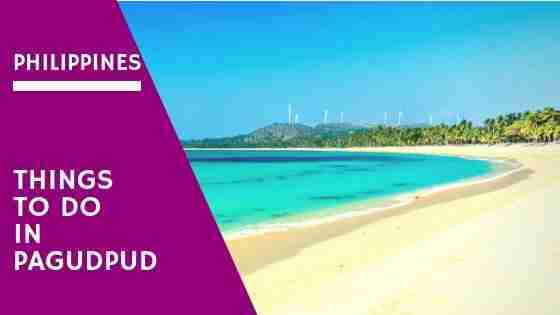 Located in the province of Ilocos Norte found in Luzon’s northern, Pagudpud is one of the thought-provoking towns in the country which will make you want to slow down and live your life from one moment to the next. To help you plan your Pagudpud adventure, here are some of the top things to do in Pagudpud Philippines you can do and activities to try in this quaint and scenic town. Kapurpurawan basically means white and it signifies the white color of the rock formations. 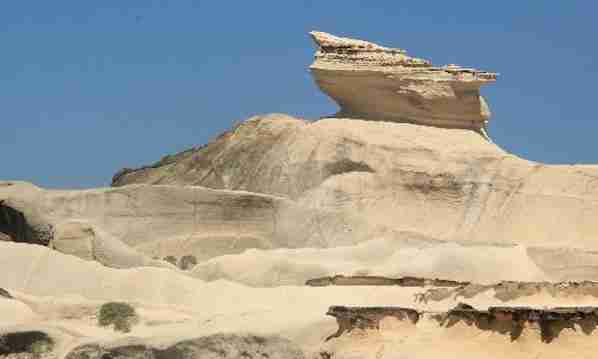 Situated in Burgos, Ilocos Norte, such rock formations were carved out of the land by the wind and the sea. See how wonderful nature works and how it can make something so beautiful and smooth out of rock. Formations may be reached on horseback or on foot. Depending on your preferences, you may choose any from the mentioned options. While several visitors want to see these formations up close, majority of photography enthusiasts would instead take some photos from a distance. The Kabigan Falls is nestled in the eastern portion of Barangay Balaoi. Surrounded by a lush jungle, the waterfall is 80 feet tall and serves as the perfect epitome of raw and untouched nature in its purest form. Underneath is a pool where you can take a dip, or even enjoy a romantic time with your special someone. Here, you will be completely surrounded by the fern gully style of setting that you can often see in utopian sci-fi movies. It is hard not to feel completely and totally alive as the rushing water falls right next to you. Pack some snacks, grab a water bottle, tie your shoelaces tight and get your camera ready as you embark on the scenic hour-long foot journey along rice paddies, farmlands and off the beaten paths to the famous Secret Green Hills. Continue walking up to the grassy steep hill through the well-trodden path to witness with your own two eyes the cliff views of Scottish style with waves crashing to the shore and rocks below. Take your exploration further to reach the savanna-like plains in which you will find the Caparispisan Wind Farm, an amazing but surprising discovery in this neck of the woods. Bangui is considered as the first town at Pagudpud’s south, which is best once you take a tour with the 2 other Burgos destinations. Bangui windmills are part of Bangui Wind Farm, which is the first and only one in the country. It is also said to be the largest in the entire Southeast Asia. This generates power for electricity, supplying forty percent of the power that Ilocos Norte needs. Every tower is sixty meters tall and six-meter diameter base. The wind farm also has a substation where personnel may talk about the wind energy as renewable energy. 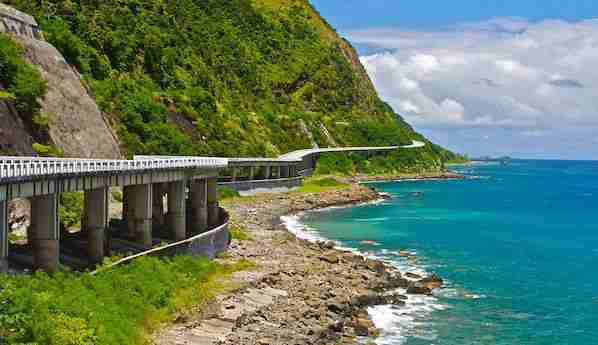 Consider renting motorbikes and go for some rides along the coast on the fourth longest bridge in the Philippines. Stretching windy 1.3km, the highway that’s well-maintained rolls around the rocky coast on the cliff that drops off to the water below. It’s definitely one of the top things to do in Pagudpud. Any ride here gives you a laidback cruise and spectacular views. The highway isn’t crowded and wide, so it is suitable even for the new riders. Take some photos or stare in the beautiful distance. After that, use the bike wisely and experience an adventure of a lifetime. If you are a huge fan of the Goonies, you will find the beachfront cave to be a bit euphoric. What seems to be a plain old big mossy boulder hides some tiny little secrets. 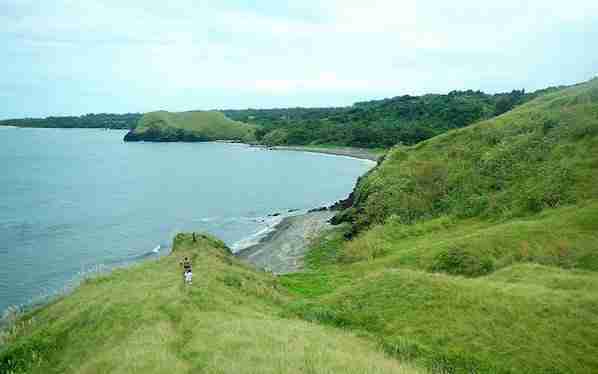 Down the small embankment and over several slippery rocks, you could make your way along its coast like until you reach Bantay Abot Cave. While it is more of a hole than caves, the way the light shines through the Bantay Abot Cave is absolutely breathtaking. Though rays of light that shines through, this place looks like the gateway to heaven. That is why it’s great for photo opp. 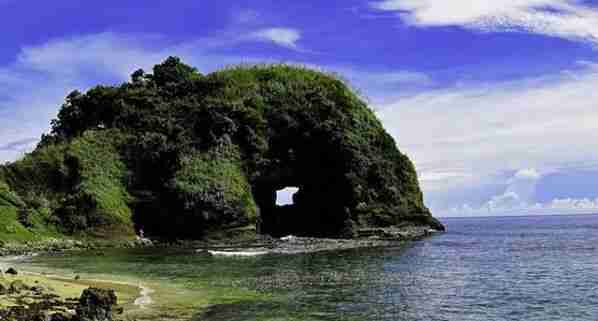 Along Pagudpud’s western coast in Brgy Balaoi, you will find Dos Hermanos Islands. In English, it’s known as Two Brothers Islands. The folklore says that there were 2 fishermen who are brothers and were swept by big waves and since then, two rocks appeared in the sea and was believed to be the two fishermen who died after getting swept by big waves. Once tide goes out, there are underwater caves you’ll see below these rocks, which are considered to be the home to the community of colorful vegetation and fish. Dos Hermanos Islands are the source of local treats of sweet gourmet. During the Spanish colonial regime, the trade ships of Spanish would travel the route between Spain and the Philippines on a regular basis. Cape Bojeador’s lighthouse in Burgos served as one of the galleons’ beacons. Currently, Burgos lighthouse was converted into a beautiful public museum. 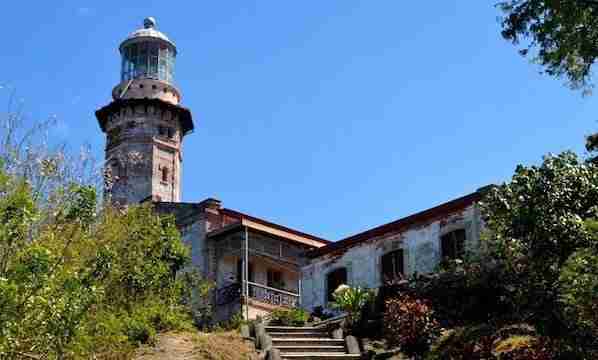 It’s also a cultural heritage structure and functions as a lighthouse for the international ships, which enter Philippine waters. Pagudpud has loads of guest houses, hostels and hotels. Here are a few places to check out if you are planning to visit Pagudpud Philippines. Featuring free WiFi, Flotsam and Jetsam Hostel offers accommodation in San Juan, 40 km from Baguio. Guests can enjoy the on-site bar. Free private parking is available on site. Free WiFi is provided in the kitchen and bar. Certain rooms include views of the sea or garden. Lockers are included in the room. Guests have access to the shared bathroom. Natures Healing Home offers accommodation just a 15-minute drive from San Fernando City. Free parking is available on-site and free WiFi is provided in public areas. The accommodation is either air-conditioned or fan-cooled. They feature a seating area. Some units have a kitchenette, dining area and/or terrace. The units have either a private bathroom or a shared bathroom, all equipped with a shower and free toiletries. Towels and bed linen are available. This property is 1 minute walk from the beach. San Juan La Union Apartments provides air-conditioned accommodation in San Juan. All rooms feature a flat-screen TV with cable channels and a private bathroom. Free WiFi is provided. Finally, Pagudpud is one of the many beautiful places you can visit in the Philippines. It has countless must-see attractions that will surely give you a great travel experience. So, if you’re in Luzon and you want to make most of your travel, this place is definitely a gem and a must visit. 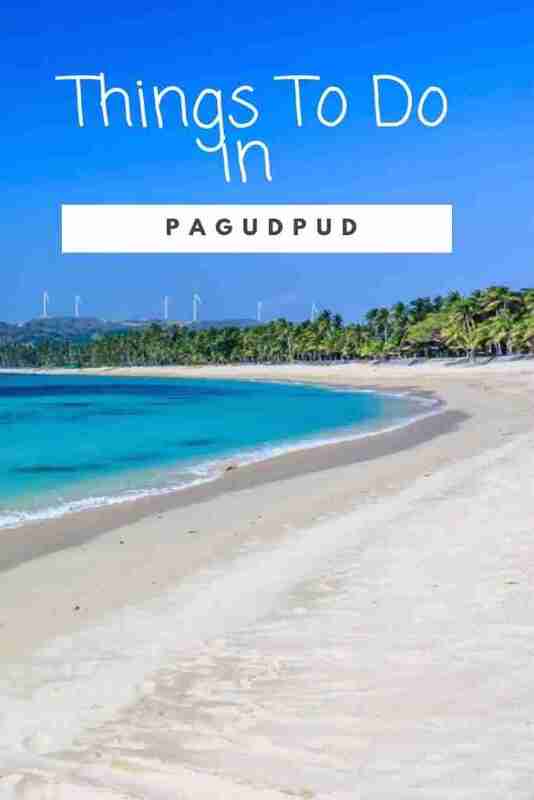 Once you visit Pagudpud, you will have plenty of options to visit, explore, discover and with many more things to do in Pagudpud. All you have to do is to choose the activities you prefer and start enjoying what Pagudpud has to offer. And that’s it for now! I’d love to know if this guide on the things to do in Pagudpud Philippines has helped you. Let me know if you have any questions and let me know if you go. Hello! I would like to know how to get to the Secret Green Hills. Thanks! !